Shi Hui, I am completely satisfied with the service. You have been prompt with your replies and have been proactive in engaging the right tutor according to my needs. I have already recommended ur agency and will continue to do so. Thanks once again for your assistance. 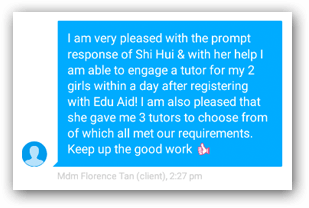 I am very pleased with the prompt response of Shi Hui & with her help I am able to engage a tutor for my 2 girls within a day after registering with Edu Aid! I am also pleased that she gave me 3 tutors to choose from of which all met our requirements. Keep up the good work!